Penguin Awareness Day is an annual informal observance created to celebrate one of the most unusual birds in the world. It is celebrated on January 20. It is unclear who and when created Penguin Awareness Day. Unlike many other ecological observances, this holiday is not official and is not affiliated to any particular environmental organization. Bur that doesn't mean that this day is not important. Penguin Awareness day is a perfect opportunity to learn about this unique birds. 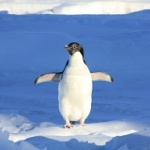 Although most people associate penguins with cold climate, not all penguin species live in Antarctica. They do, however, live almost exclusively in the Southern Hemisphere. Outside Antarctica, penguins can be found in Australia, New Zealand, South Africa, Peru, Chile, the Galapagos Islands, and the Falkland Islands. Penguins can't fly, but they are perfectly adapted to aquatic life, which distinguishes them from most of the bird species. They are popular around the world due to their unusual gait and black-and-white plumage that reminds of a tuxedo. Besides, they seem no have to special fear of humans and often approach them without hesitation. How to celebrate Penguin Awareness Day? You can spend it watching cute penguin videos or documentaries on YouTube, binge-watch The Penguins of Madagascar (all seasons of the animated series plus the feature film), or even wear a tuxedo to honor penguins. Your choice!